FILE - Mary Rezaian, mother of detained Washington Post correspondent Jason Rezaian, right, and Jason's wife Yeganeh leave a Revolutionary Court building in Tehran, Iran, Aug. 10, 2015. Iranian state television reported late Sunday that Washington Post reporter Jason Rezaian has been convicted on charges that included espionage. The report quoted a judiciary spokesman, but did not include any details of the verdict except that Rezaian and his lawyer are eligible to appeal the conviction within 20 days. The journalist's brother Ali Rezaian , who has campaigned for his release, called the news "just the latest cruel step in the outrageous legal process." "Our mother, Jason's wife, and Jason's lawyer went to court today to seek clarification on any verdict in his case... They were provided no further information under the guise of a translator not being available. As a consequence, at this point we still have no clarity regarding Jason's fate," he said in a written statement. "Should the verdict be anything other than a full exoneration, we will appeal and seek the justice that Jason deserves," Ali Rezaian added. 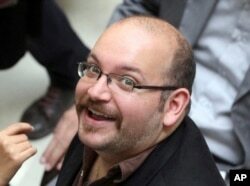 FILE - Jason Rezaian, an Iranian-American correspondent for the Washington Post, smiles as he attends a presidential campaign of President Hassan Rouhani in Tehran, April 11, 2013. Washington Post Executive Editor Martin Baron called the verdict "an outrageous injustice" and said the newspaper is working with Rezaian's family and legal team to seek an immediate appeal. "Iran has behaved unconscionably throughout this case, but never more so than with this indefensible decision by a Revolutionary Court to convict an innocent journalist of serious crimes after a proceeding that unfolded in secret, with no evidence whatsoever of any wrongdoing," Baron said in a statement Monday. He called the verdict a "contemptible" end to the case and said Iranian leaders have an obligation to "right this grievous wrong." Rezaian had been working for The Washington Post in Iran since 2012 before he was arrested in July 2014 and held for months without formal charges. Iranian authorities also arrested his wife, Yeganeh "Yegi" Salehi, and two other people. Salehi, also a journalist, has since been released, but Rezaian has remained in jail. Last month, Iranian President Hassan Rouhani indicated his government would work to free Razaian and two other Americans from prisons in Iran if the United States released jailed Iranians.